Community Supported Agriculture (CSA) is a way for citizens to directly support farming and farmers in their communities. 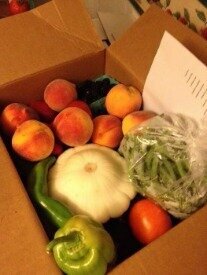 Members purchase a share of a farm’s produce for the growing season. These shareholders pay their money upfront and in return typically receive a weekly delivery of what is in season at their local farm. The benefits of reduced transportation costs, having a varied local diet, and a direct positive impact on communities are some of the benefits of participating in this process. 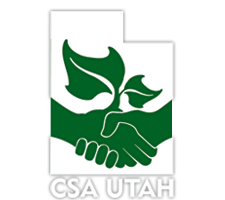 CSAUtah.org is your gateway to Community Supported Agriculture in Utah. Mark your calendars! Our annual Community Supported Agriculture Open House will be Wednesday March 13, 2019 at the Activity Barn at Wheeler Farm from 6-8 pm. This is your chance to comparison shop the season long harvest share programs of several local farms. If you are in the Salt Lake City area this is a great opportunity to find the program that fits you best. But many of the farms there that night offer drop off locations throughout the Wasatch Front, Tooele County, Box Elder County, Cache County and Summit County. The event is free. See you there! While we appreciate all the CSA farms in Utah for the great work they do, we especially want to thank those farms pay a sponsorship fee that helps support this website, the annual open house and the other programs of CSA Utah and the Great Salt Lake RC&D. Thank you to Borski Farms and Urban Farm and Feed! Members that participate in Community Supported Agriculture have an opportunity to talk with the farmer and visit their farm to see how their produce is grown. Many CSA farms allow shareholders to get involved in a variety of field events and gain an understanding of what is involved in growing their food in a way that is often consistent with their values. This active dialogue can increase the quality of the experience of buying and eating fruits and vegetables produced in the ecosystem you live. There many tangible and intangible benefits associated with buying local products in your local Utah community. Spending your money on locally produced goods and services keeps the community economically viable. Just like the unique character of each CSA farm, economies also benefit from the local flavor of these small businesses. Buying local conserves natural resources, reliance on fossil fuels is greatly reduced due to less shipping requirements. CSA farms do their part to protect the environment, most of these operations incorporate organic or natural methods that work in harmony with nature. The closer you are to your food supply, the shorter the distance it travels to your table and increases the quality and flavor of your favorite fruits, veggies, and other products you enjoy. Eating fresh local produce helps consumers understand how their food is grown. These typically small local farms help preserve the genetic diversity that larger centralized farms cannot.